Krut’aite (also spelled Krutaite) is a rare mineral with the formula CuSe2. It crystallizes in the cubic crystal system. It has no industrial use, but it is a prized collector’s item. It was first identified in Petrovice, Okres Žďár nad Sázavou, Czech Republic, which is the only known locality in the Czech Republic for the mineral, but it has since been identified in other places in the world. 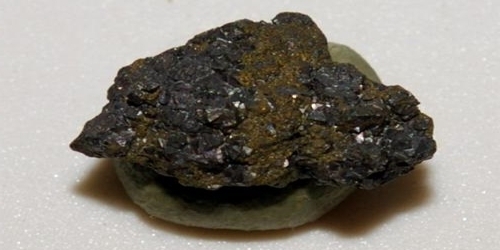 It is part of the pyrite group, being composed of Cu2+ ions and Se22- ions. The mineral is most often found as a dark grey aggregate consisting of tiny crystals no more than a millimeter in size. The crystals are opaque in any size. Crystal habit: Often found as inclusions or octahedral crystals. 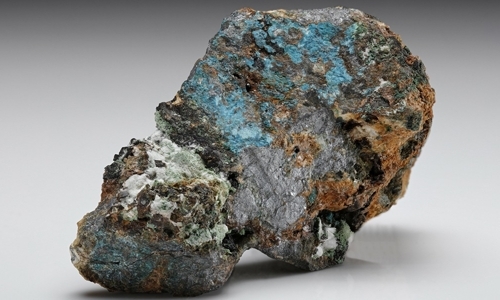 Krut’aite forms through hydrothermal processes and is often associated with clausthalite, eskebornite, berzelianite, uraninite, hematite, ferroselite, bukovite, umangite, chalcopyrite, and goethite. It forms a solid solution series with trogtalite. Weintraub Mine, Lerbach, Rosenhof veins, Clausthal-Zellerfeld, Harz, Lower Saxony, Germany. Tumiñico Mine, Sierra de Cacho, Villa Castelli, General La Madrid department, La Rioja, Argentina.